On August 9, 1949, the first successful oil well in western Nebraska came in for 225 barrels of oil per day at a total depth of 4,429 feet. Marathon Oil Co. completed the discovery well, Mary Egging #1, located four miles east and two miles north of this marker, and five miles southeast of the town of Gurley. The oil discovery ended 60 years of unsuccessful searching in western Nebraska. The first reported interest for oil occurred in 1889, near Crawford, in the northwest corner of the Panhandle. The first recorded drilling operation took place in 1903 near Chadron, also in the northern part of the Panhandle. In 1917, the first exploratory well to drill in the southwest Panhandle, near Harrisburg, failed. Oil searchers sunk many other dry test wells in western Nebraska until success came in 1949. Wells in the Nebraska Panhandle through 1966 had produced more than 216 million barrels of oil. 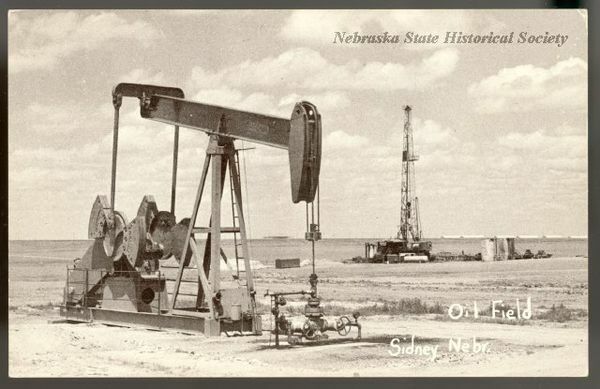 Nebraska's first successful oil well was completed in 1940 in the southeastern corner of the state.